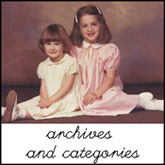 Several years ago, my children participated in an ATC Swap hosted by House on Hill Road and Wise Craft. What is an ATC Swap? ATC stands for Artist Trading Card. An ATC is a specifically sized card, upon which a small work of art is created. All ATCs are 2.5"x3.5". Watercolor paper, Bristol Board, or illustration board may be used for the card. Any medium can be used on the card. Watercolor, collage, pencil sketching....the list goes on and on. Basically, you can think of an ATC as a tiny blank canvas. 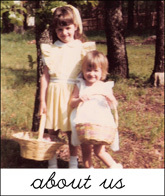 In the swap, each of my children was put into a group with other children his/her age. Superoby made five ATCs and mailed one card to each of the other children in his group. Same with Pupmkin--she mailed one of her tiny masterpieces to each of the other kids in her group. And a few days later, the mail goodies started rolling in. What fun it was to receive ATCs in our mailbox from the other members of their groups! My children loved the experience. 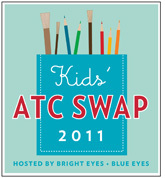 With Erin & Blair's blessing, the ATC swap was hosted by Bright Eyes + Blue Eyes in 2011. We're hosting the swap again this year. 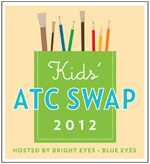 (1) The swap is open to children Ages 4-12. (3) Registration opens Friday, October 5th. (5) The mail date is going to be Monday, November 5th. All participants will mail their cards on that date. Please send an email or leave a comment if you have any questions. Have fun! Please do not take words or photos from our blog without permission. Thank you!